The famously named "Ring Nebula" is located in the northern w:constellation of w:Lyra, and also catalogued as Messier 57, M57 or NGC 6720. It is one of the most prominent examples of the deep-sky objects called w:planetary nebulae (singular, planetary nebula), often abbreviated by astronomers as simply planetaries or PN. Location of M57 in the constellation Lyra. M57 is located in w:Lyra, south of its brightest star w:Vega. w:Vega is the northeastern vertex of the three stars of the w:Summer Triangle. M57 lies about 40% of the angular distance from β Lyrae to γ Lyrae. M57 is best seen through at least a 20 cm (8-inch) w:telescope, but even a 7.5 cm (3-inch) telescope will show the ring. Larger instruments will show a few darker zones on the eastern and western edges of the ring, and some faint nebulosity inside the disk. This nebula was discovered by w:Antoine Darquier de Pellepoix in January, 1779, who reported that it was "...as large as Jupiter and resembles a planet which is fading." Later the same month, w:Charles Messier independently found the same nebula while searching for w:comets. It was then entered into his catalogue as the 57th object. Messier and w:William Herschel also speculated that the nebula was formed by multiple faint stars that were unable to resolve with his telescope. In 1800, Count w:Friedrich von Hahn discovered the faint central star in the heart of the nebula. In 1864, w:William Huggins examined the spectra of multiple nebulae, discovering that some of these objects, including M57, displayed the spectra of bright w:emission lines characteristic of fluorescing glowing gases. Huggins concluded that most planetary nebulae were not composed of unresolved stars, as had been previously suspected, but were nebulosities. Planetary nebulae are formed after medium or low mass stars, such as the Sun, exhaust their hydrogen fuel in the stellar core. At this point the structure of the star changes so it can achieve a new equilibrium condition in which it can continue to burn; the outer layers of the star expand and it becomes a w:red giant. Further internal temperature instabilities develop from the fusion reactions, causing the outer atmosphere to be expelled by hot superwinds either continuously or in several energetic pulses. This expanding gaseous shell forms the spherical nebula, brightly illuminated by w:ultraviolet energy from the central star. The Ring Nebula in infrared. All the interior parts of this nebula have a blue-green tinge that is caused by the doubly-ionized w:oxygen w:emission lines at 495.7 and 500.7 nm. These observed so-called "w:forbidden lines" occur only in conditions of very low density containing a few atoms per cubic w:centimeter. In the outer region of the ring, part of the reddish hue is caused by w:hydrogen emission at 656.3 nm, forming part of the w:Balmer series of lines. Forbidden lines of ionized w:nitrogen or [N II] contributes to the reddishness at 654.8 and 658.3 nm. M57 is an example of the class of planetary nebulae known as bipolar nebulae, whose thick equatorial rings visibly extend the structure through its main axis of symmetry. It appears to be a w:prolate spheroid with strong concentrations of material along its w:equator. From Earth, the symmetrical axis is viewed at about 30°. Overall, the observed nebulosity has been currently estimated to be expanding for approximately 1,610±240 years. Structural studies find this planetary exhibits knots characterized by well developed symmetry. However, these are only silhouettes visible against the background emission of the nebula's equatorial ring. M57 may include internal w:N II emission lines located at the knots' tips that face the PNN; however, most of these knots are neutral and appear only in extinction lines. Their existence shows they are probably only located closer to the ionization front than those found in the Lupus planetary w:IC 4406. Some of the knots do exhibit well-developed tails which are often detectable in optical thickness from the visual spectrum. The central PNN was discovered by Hungarian astronomer Jenő Gothard on September 1, 1886 from images taken at his observatory in Herény, near Szombathely (now part of Szombathely). Within the last two thousand years, the central star of the Ring Nebula has left the w:asymptotic giant branch after exhausting its supply of w:hydrogen fuel. Thus it no longer produces its energy through w:nuclear fusion and, in evolutionary terms, it is now becomimg a compact w:white dwarf star. The PNN now consists primarily of w:carbon and w:oxygen with a thin outer envelope composed of lighter elements. Its mass is about 0.61–0.62 w:solar mass, with a surface temperature of 125,000±5,000 K. Currently it is 200 times more luminous than the w:Sun, but its w:apparent magnitude is only +15.75. ↑ a b c d "SIMBAD Astronomical Database". Results for Messier 57. http://simbad.u-strasbg.fr/Simbad. Retrieved 2006-12-19. ↑ a b c O'Dell, C. R.; Balick, B.; Hajian, A. R.; Henney, W. J.; Burkert, A. (2002). "Knots in Nearby Planetary Nebulae". The Astronomical Journal 123 (6): 3329–3347. doi:10.1086/340726. http://adsabs.harvard.edu/cgi-bin/nph-bib_query?bibcode=2002AJ....123.3329O. ↑ Harris, Hugh C.; Dahn, Conard C.; Canzian, Blaise; Guetter, Harry H.; Leggett, S. K.; Levine, Stephen E.; Luginbuhl, Christian B.; Monet, Alice K. B.; Monet, David G.; Pier, Jeffrey R.; Stone, Ronald C.; Tilleman, Trudy; Vrba, Frederick J.; Walker, Richard L. (February 2007). "Trigonometric Parallaxes of Central Stars of Planetary Nebulae". The Astronomical Journal 133 (2): 631–638. doi:10.1086/510348. http://adsabs.harvard.edu/abs/2007AJ....133..631H. ↑ Murdin, P. (2000). 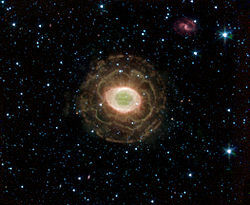 "Ring Nebula (M57, NGC 6720)". Encyclopedia of Astronomy and Astrophysics, Edited by Paul Murdin, article 5323. Bristol: Institute of Physics Publishing, 2001. Http://eaa.iop.org/abstract/0333750888/5323. doi:10.1888/0333750888/5323. http://adsabs.harvard.edu/cgi-bin/nph-bib_query?bibcode=2000eaa..bookE5323..
↑ a b Crossen, Craig; Rhemann, Gerald (2004). Sky Vistas: Astronomy for Binoculars and Richest-Field Telescopes. Springer. ISBN 3211008519. OCLC 52424007. ↑ Garfinkle, Robert A. (1997). Star-hopping: Your Visa to Viewing the Universe. Cambridge University Press. ISBN 0521598893. OCLC 37355269. ↑ Messier, Charles (1780). Catalogue des Nébuleuses & des amas d'Étoiles, Connoissance des Temps for 1783. pp. 225–249. ↑ Frommert, Hartmut; Kronberg, Christine. "William Huggins (February 7, 1824 - May 12, 1910)". Students for the Exploration and Development of Space. Archived from the original on 2008-04-21. http://web.archive.org/web/20080421100135/http://seds.org/messier/Xtra/Bios/huggins.html. Retrieved 2008-04-11. ↑ Huggins, W.; Miller, W. A. (1863–1864). "On the Spectra of Some of the Nebulae. And On the Spectra of Some of the Fixed Stars.". Proceedings of the Royal Society of London 13: 491–493. doi:10.1098/rspl.1863.0094. http://www.jstor.org/pss/112077. Retrieved 2007-02-04. ↑ De Loore, C. W. H.; Doom, C. (1992). Structure and Evolution of Single and Binary Stars. Springer. ISBN 0792317688. OCLC 25711985. ↑ a b Karttunen, Hannu (2003). Fundamental Astronomy. Springer. pp. 314. ISBN 3540001794. ↑ a b O'Dell, C. R.; Sabbadin, F.; Henney, W. J. (2007). "The Three-Dimensional Ionization Structure and Evolution of NGC 6720, The Ring Nebula". The Astronomical Journal 134 (4): 1679–1692. doi:10.1086/521823. http://adsabs.harvard.edu/abs/2007AJ....134.1679O. Retrieved 2008-03-31. ↑ O'dell, C. R.; Balick, B.; Hajian, A. R.; Henney, W. J.; Burkert, A. (2003). "Knots in Planetary Nebulae". Winds, Bubbles, and Explosions: a conference to honor John Dyson, Pátzcuaro, Michoacán, México, September 9-13, 2002 (Eds. S. J. Arthur & W. J. Henney) Revista Mexicana de Astronomía y Astrofísica (Serie de Conferencias) (http://www.astroscu.unam.mx/~rmaa/) 15: 29–33. http://adsabs.harvard.edu/cgi-bin/nph-bib_query?bibcode=2003RMxAC..15...29O. This page was last edited on 13 August 2014, at 21:26.